The less attention we paid to consumerist society's expectations, the easier getting married became. While some of our friends couldn’t believe that we were going to make our wedding political, our thought was, “How could we not?” The personal is political. As humanists, it was important to us that our actions reflect not only our values, but come from a place of reflection on our growing awareness of the consequences of our actions. For us, once we know that something is harmful or unjust, we believe we have an obligation to do something about it. No aspect of our life is off limits, including our wedding. For us, a relatively young couple thinking about having children, the climate crisis was on the forefront of our minds. We were also concerned about the corrosive effect of a society that turns every experience into a transaction and tells us that you can shop your way to love and happiness with greener, better products. And, finally, there was the historical baggage to deal with — oppressive religious traditions, the subordination of women, unequal access to marriage benefits. Could we create a ceremony that reflected our commitments on these issues while still feeling celebratory? Here are some ways that we were able to do just that. Most people want their wedding to be affordable. We were no exception. But we wanted our wedding to be more than affordable. We wanted to escape the wedding-industrial complex that injects people with needs and desires that are ultimately incompatible with their long-term happiness and only serve to drive corporate profits. Firstly, we realized it would need to be inexpensive for people to attend. Having family members stay at local hotels would have been prohibitively expensive. We decided to rent low-cost housing that came with kitchen access using the website Vacation Rentals by Owners. This had the added advantage of allowing our guests to prepare food. Cooking food together is an inviting and accessible way to get people to have conversations with each other. We did our best to arrange it so that my husband’s friends and family were staying with my friends and family so that ties could form between the two groups. 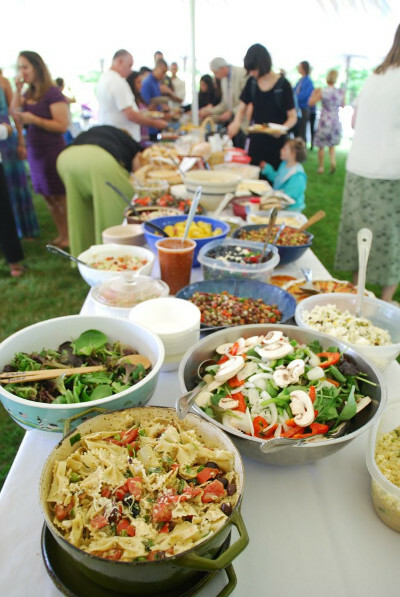 Since making and sharing food was such a powerful symbol to us of people coming together to support a couple, we decided that the lunch after the wedding would be potluck. By asking each person to bring a dish big enough to serve five people, we could invite as many people as we wanted without worrying about plate-count. This meant that I could hand each of my parents and grandparents a stack of 30 or so invitations and tell them that they could invite whomever they wanted. For the ceremony, we decided to change things up from the typical template. I have never liked the idea of fathers walking their daughters down the aisle to give them away to another man, as if women are property to be exchanged; I also don’t like the “Here Comes the Bride” moment, which can make it seem as if the whole event is all about showcasing the woman. In order to make clear that our union was about two equals coming together from different families, we decided to walk in at the same time from different sides of the room. I was accompanied by all the women of both families, and he was accompanied by all the men of both families — with special attention to accommodating people’s gender identities. This structure not only allowed us to symbolize equality, but once again gave the two different families time to meet each other. 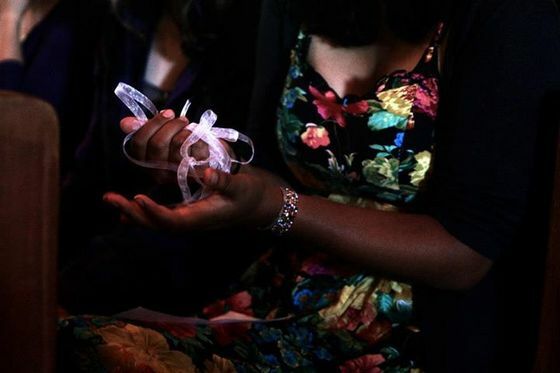 During the ceremony, which was both in English and my husband’s native Quebecois French, guests were given a little piece of string. We asked everyone to look to the person next to them and tell them a wish they had for us as a couple moving into this next phase of our lives. The person sitting next to them would reciprocate, and then they would tie their strings together. These strings were collected and brought up to the stage before we made our vows. We purposely designed this activity to be a little confusing. We wanted people to be talking to each other as well as to have to work together to meet a challenge — as couples must in marriage. Lastly, we decided against using rings, not only because of their expense and environmental impact, but because neither of us likes wearing them. We opted for a handfasting ceremony instead, in which a scarf-like cloth is tied around the hands of the couple as they say their vows. Talk about tying the knot! (The idea originally came from watching old Doctor Who episodes while we were snowed in one night.) This practice, which was once common in medieval Europe, fell by the wayside as the church began to formalize its power. As atheist humanists, we thought it was an appropriate tradition to revive. With all the magazines and TV shows trying to make us think that weddings are all about expensive dresses, cakes, frill and opulence, sometimes it can be hard to remember that it’s not about any of that. It’s not about the stuff. One of the most common things that people focus on in our fashion-crazed culture is what everyone is wearing, especially the bride. While I admit that I’ve watched Say Yes to the Dress more than once, and I respect that people like to express themselves through their clothing, there’s a difference between personal expression and showing off your economic status in a profoundly unequal society. I had no interest in thousand dollar designer dresses. I did end up wearing a dress, though, because I think they’re fun. It was $70 at a thrift shop. It wasn’t exactly what I had had in mind, but it was good enough. After all, it didn’t really matter what I wore; to me beauty is a feeling that comes from the inside and doesn’t depend on what I am wearing. My husband also wanted to find something that was special and out of the ordinary. He had lived in India for awhile, and the men there wear fantastic garments at their weddings, which he thought about wearing. But the cultural appropriation didn’t quite feel right to us. In the end, we found something special for him through a member of our family. My husband was close enough in size to my great uncle that he was able to wear the beautiful cream-colored suit that my uncle had worn at his wedding. For my bridesmaids, rather than forcing them into the same kind of dress, I invited them to wear any dress they wanted, formal or informal, in a medium shade of blue, a color I knew they all liked. I loved the way the different shades came together bringing together a sense of unity among individuality. As for decorations, we did our best to keep things local, seasonal and, when possible, edible. Instead of lavish flowers likely picked by poor, exploited women in Ecuador and Columbia harmed by the pesticides sprayed on the ground to kill weeds and prevented from unionizing for better conditions, we wanted local, seasonal decorations. We hired local farmer and caterer extraordinaire Theresa Freund, from Freund’s Farm and Market in Canaan, Conn., to help with set-up and table decorations. Theresa created exquisite mixed bouquets of the flowers in season on her farm. For centerpieces Theresa assembled big baskets of freshly-picked, local September-ripe apples, which people took home with them as party favors. We had our guests pick the apples the day before at Averill Farm in Washington, Conn. The money we spent on local apples not only supported the local economy, but it helped us have an experience of togetherness, not just some fancy material goods. As an environmentalist concerned about the impacts of many products and the conditions under which they produced, choosing materials and food for an event is no small task. It was important to me to avoid products that I knew were built on the exploitation of others or that had harmful environmental impacts. Firstly, we insisted that all emissions for travel should be offset. On our RSVP form, we invited people to offset their travel emissions — it’s less expensive than you think — with one of several reputable offsetting companies. We told them that if they did not offset their emissions, we would pay for them through TerraPass, a certified for-benefit company that does emissions offsets through projects in the United States, where emissions reductions are needed most. We included this as a non-negotiable part of our wedding budget. For us, not taking into account the social and environmental costs of carbon pollution while having the means to do so would have been unconscionable. Secondly, we asked that all food at the potluck be vegetarian. Industrial meat production is hugely fossil-fuel intensive, and we wanted to show people not only that vegetarian food can be delicious and fulfilling, but also that it comes in tremendous variety. By having a potluck, it was guaranteed that everyone would have a least one dish that they liked to eat. We were able to get a significant amount of produce from nearby Marble Valley Farm in Kent, Conn., for people to use in their cooking. Finally, there were lots of little things that we did to reduce our impact. The beer we served was solar-brewed from the Barrington Brewery in Great Barrington, Mass. All the dining ware that wasn’t washable was compostable. Overall, it helped a lot to be on the lookout for when advertising-imposed expectations were getting in the way of keeping our wedding simple, local and true to our values. The less we paid attention to those expectations, the easier everything became. For us, inspiring others to take action on climate change was more important than anything. This will be the defining issue of our lives and almost certainly our future children’s lives, too. We know that the industrialized world’s rabid consumption of stuff requires huge amounts of energy, yet many people refuse to take the problem seriously enough to reduce emissions in the drastic ways that are needed. This problem was too big to ignore at our wedding. We really wanted to encourage people not to give us stuff, most of which wouldn’t fit in our little New York apartment anyway. Instead, we suggested that they could donate in our name to one of five groups: 350.org, whose networking skills and science-based platforms have been driving the global climate movement; the Electronic Frontier Foundation, whose work supports the freedom of the Internet; Peaceful Uprising, founded by Tim DeChristopher, whom we had met just before he was sent to jail for bidding on and winning public land that was being auctioned off for coal and gas exploration; Rootstrikers, which is working on passing a constitutional amendment to overturn corporate personhood; and the National Lawyers Guild, without whose support so many of my friends, future generations of protesters and I would be stuck in jail. Even our conservative family members who wouldn’t like most of those organizations could at least support people getting legal representation from the NLG in the backward court system. 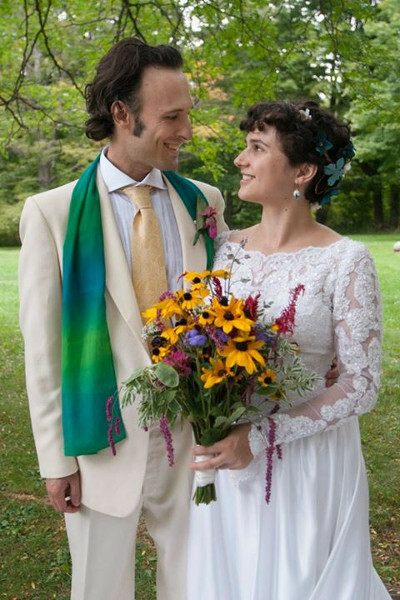 For my husband and me, the wedding was about bringing our families together, inviting our communities to recognize and support us as a couple in the years to come, and celebrating our values of sustainability, community, political action and atheism. We developed a weekend of interactive events and a unique and meaningful ceremony that felt right to us. It cost us about $3,000 total, all of which we received back in small gifts. Part of that cost includes voluntary donations we gave to the music hall and community groups that let us use their tables, chairs and space. (In comparison, the average cost of a wedding in various parts of the country is between $15,000 and $75,000.) After the knot was tied, the contra dance was over and the singing ended, dozens of our 300 invitees told us that it was the most fun wedding they had ever been to. Awesome wedding and couple! Thank you! !